The AMSAT-Phase 3E satellite (P3E) is dedicated as communication and scientific platform for a highly elliptical orbit around Earth. 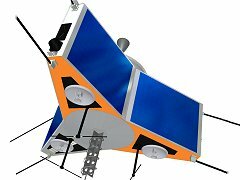 The spacecraft will be created in a joint process together with the P5A Mars mission by an international team under leadership of AMSAT-DL and continues the successful series of AMSAT-Phase 3 satellites. Additionally the spacecraft will be a test bench for technology developped for the Mars mission. The main task of P3E is to act as communication platform for radio amateurs worldwide. A launch isn’t planned we are waiting for an opportunity. As a communications satellite, P3E will carry several transponders useful to radio amateurs and having bandwidths between 50 and 200 KHz. The emphasis will lie on the lower VHF/UHF frequencies between 145 and 2400 MHz. That simplifies the free world-wide radio operation independent of the propagation variability of short-wave and away from the anonymity of Internet chats. Due to the efficient HELAPS transmitter technology and a newly developed, software-defined transponder (SDX/STELLA), radio operation will also be possible for small and portable stations. The software technology will also enable flexible digital transmission methods. For microwave experiments, P3E includes additional beacons and transponders. 145 MHz, 2400 MHz, 10.45 GHz, 24 GHz, 47 GHz. 435 MHz, 1268 MHz, 2450 MHz, 5.67 GHz.